This week I’m house sitting for some friends, at the same house with the wasp hotels and the ant possessed by liver flukes. When I was invited over for dinner a little over a week ago, I was enticed by the mention of a little caterpillar that was wandering around in the flower arrangement on the dinner table, wearing a disguise made of bits of flowers. That description was enough to identify it as a “camouflaged looper” (Geometridae: Synchlora aerata), and I was excited to see it, having never seen one in person before. When I arrived (on July 1), it had attached its costume to a leaf and pupated inside. I asked it nicely to wait until I came back to house sit before it emerged as an adult moth. It hadn’t budged when I arrived this weekend, and I put it in a jar so the moth wouldn’t end up caught in a spider web or something. This morning I checked the jar and found the adult: a beautiful Wavy-lined Emerald. 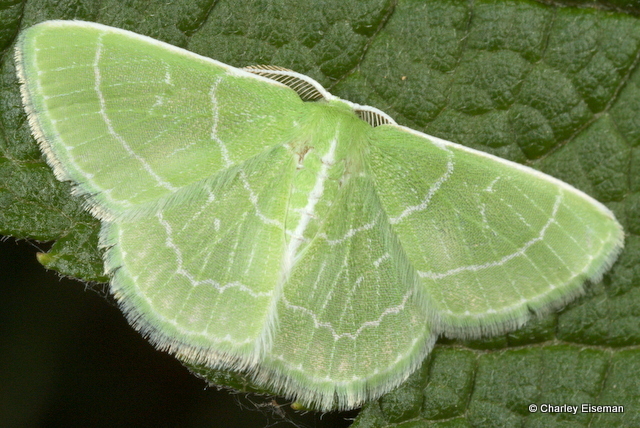 Emeralds are a whole subfamily (Geometrinae) of inchworm moths (Geometridae) with similar-looking, green adults. Only certain species in the genus Synchlora disguise themselves with flower pieces, and S. aerata is the only one in northern North America with this habit. If you collect a camouflaged looper in the South, you will likely end up with a different moth. After our photo session, I stuck the emerald back in among the zinnias, from whence it had come. This entry was posted in Uncategorized and tagged camouflaged looper, cocoon, emerald, Geometridae, Geometrinae, inchworm, moth, Synchlora, Synchlora aerata, wavy-lined emerald. Bookmark the permalink. Thanks for sharing this. Nice photos. 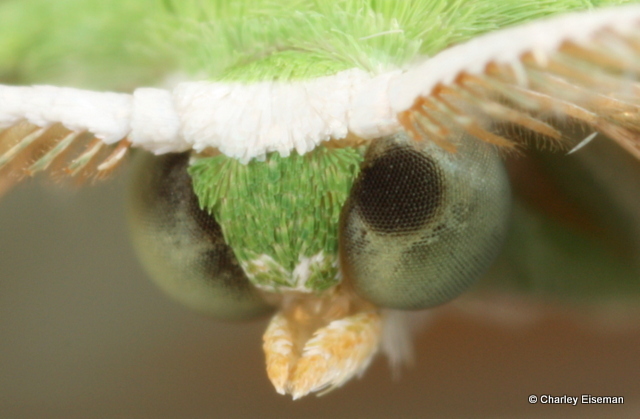 I especially like the last one, a perspective rarely seen in moth photography. The little red “insect?” in the first photo adds mystery to the scene. 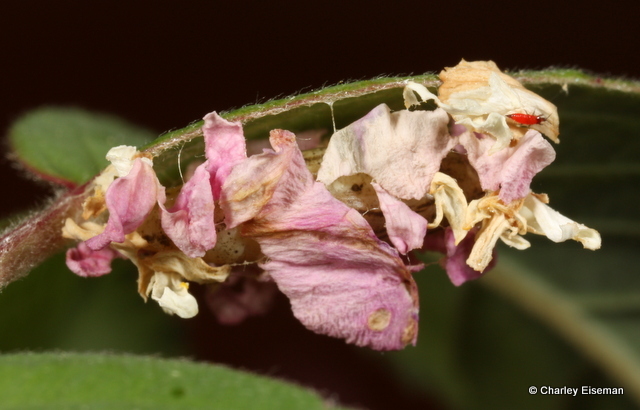 I was wondering if anyone would notice — that’s a thrips. In the first photo I took of the cocoon, there was also a tiny leafhopper nymph next to it. Neither insect was noticeable to unaided eyes. Amazing how much life can be in a little flower arrangement on the dinner table! Nice! I didn’t realize they had those white markings, having never seen a photo of one so sparsely adorned before. Hi Pete — The red bug in my photo is a thrips, but I don’t think that’s what yours are. Maybe larvae of one of the many fungus-specific beetles? I bet if you post a pic to BugGuide.net, you’ll get an ID pretty quickly.